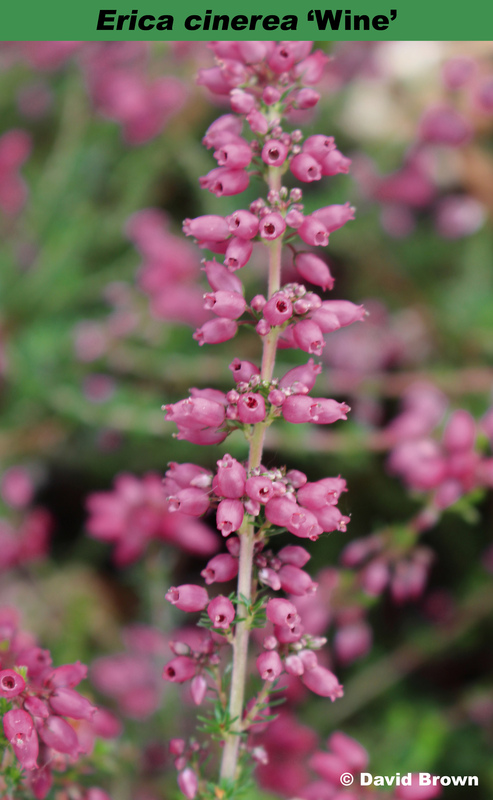 Erica cinerea often refered to as Bell Heather, ranges from western Norway and the Faeroe Islands through Ireland, Britain, north-western Germany, Netherlands, Belgium, France, north-western Italy, Spain and Portugal, and with an isolated colony in Algeria. Bell heather requires an acid soil, an open sunny position and is suitable for hardiness zone 7 provided some protection is given. Erica cinerea 'Wine' is something different from the large collection of Erica cinerea cultivars in flower at this time of the year . 'Wine' has dull pale ruby (H5) flowers, similar to the beverage many enjoy!